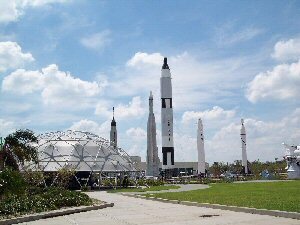 The Kennedy Space Center was one of the places that I wanted to visit while in Florida. I booked this when I got to my hotel and therefore did not know if and when Hurricane Jeanne would interrupt my holiday. Unfortunately Hurricane Jeanne was heading for Florida and was due to hit in a few days. 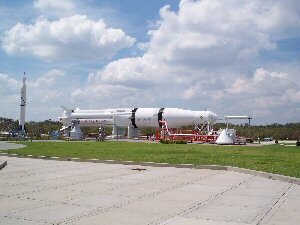 Because of this, the main tours at the Kennedy Space Center were not running as they were preparing for the hurricane. However the trip went ahead, though I only got to visit the Visitor Center and the Astronaut Hall of Fame. Walking round the Visitor complex, the first thing that I went to was the IMAX films. I had heard about IMAX, and was interested in what they would be like. They had two running, they were OK, but I was hoping for something a lot better. Even the one that was in 3-D did not seem that impressive to me, (comparing it to Shrek 3-D at Universal Studios would be like comparing Mono sound to Dolby Digital 5.1). Maybe it was just the films, and others may be a lot better. I walked around looking at the other exhibits. Some were OK, the full size replica Space Shuttle was nice to walk through. I looked round the other exhibits and had a snack. I took some photos before it was time to go back to the coach and up to the Astronaut Hall of Fame. I didn't find this too exciting, though one area did have a few interesting things in it. After everyone had finished it was time to go back to the hotel. It had been nearly a full day out, and whilst it was interesting in parts, it would have been much better if the tours were running. Maybe I'll get to do that some other time.